I made all of the printables for the "Welcome Little Deer" baby shower (click HERE to see the full party.) Making printables for parties can be pretty time consuming, but the workload is significantly lessened if you have the right tools. I used Photoshop and my Silhouette Cameo craft cutter a TON for this party. I really don't know what I'd do without either. I'm completely self-taught when it comes to design, and really it's been the result of a lot of trial and error and reading other peoples' blogs. Pugly Pixel is an amazing resource for great Photoshop tutorials and tips in case you're wanting to learn more about using Photoshop. Katrina is a Photoshop genius, and she's very clear in her tutorials. Definitely check her out! If you want to go the easier route, PicMonkey is also a great free online program for photo editing that you could easily use for designing as well. When it came to cutting everything out, my Silhouette Cameo was a life saver. I couldn't imagine cutting out 60 sandwich flags, 2 dozen cupcake toppers and wrappers, and 20 treat toppers by hand. My Cameo did it all in seconds! The Silhouette online store is also a great resource for images that can give your final product professional-looking results if you don't know how or don't want to make your own. For the invite, I kept to a simple layout and chose a deer silhouette using free clipart on Microsoft Word. This is the front and back of the invite, but I removed the personal information because, while we love you all, we're not ready for total strangers to show up at Shannon's house uninvited lol. Printables were essential in styling the food. First, I made cupcake toppers using Photoshop. They were simply hot glued to toothpicks and inserted into the cupcakes. They really add to the overall look and theme, don't you think? I made ones that say "welcome little deer" and ones with just the deer head. And luckily for all you wonderful people, we're offering the cupcake toppers as a free download! Just click HERE, and you'll be taken to the page to download the free toppers. Print on card stock for the best outcome. The cupcake wrappers were also made using Photoshop, and the scallop wrapper design was downloaded from the Silhouette online store (Can you tell I'm obsessed with my Cameo?) I love how the wrappers turned out, I'll definitely be using the design for future parties! I also cut out little flags for the sandwiches, wraps, and gobs. These were crazy easy. It was just a matter of making a little flag design in Silhouette Studio and cutting out a bunch of them and gluing them to toothpicks. Finally, the last printables I made, and my very favorite might I add, were the treat toppers for the buckeyes that we gave away to guests. I designed the labels to be just long enough to fit plastic sandwich or snack baggies. I printed them out, folded them, and then stapled the tags to the plastic baggies. Easy, but with a really cute effect. Note: I got the digital chevron paper that I used for all the printables on Design House Digital which, in case you've never been to the website, is a great resource for downloadable digital papers and other designs for digital scrapbooking! The chevron digital paper is by Celeste Knight, and she offers it in several different colors for free. Design House Digital also offers several other free downloadable papers, so they're definitely a site to bookmark. Hope you all enjoyed everything! I love all the cupcake accessories! The prints you made are so cute! Love the cupcake wrappers! Absolutely adorable! Thanks for sharing!! How cute! Would love if if you linked up on my blog hop www.w-t-fab.com/search/label/bloghop. Also let me know if you'd like to follow each other! OMG LOVE the favors!! Im obsessed with chevron.. this is super cute! 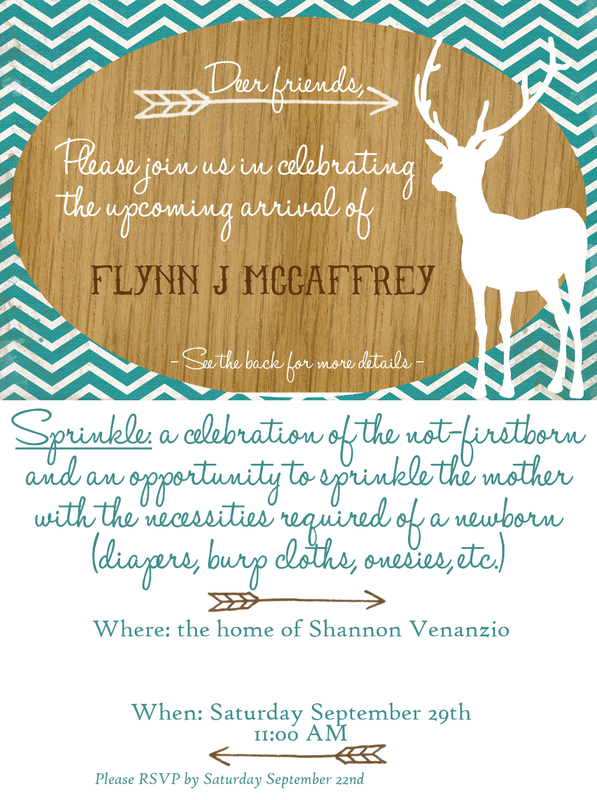 These are sooo cute, i would love to do this for my dtr law, how do you get the Deer Silhouette? And where do you find the deer figurines? Hi Tiffany! You can find more details on where we got things in the post :) the deer silhouette was a clipart picture in Word, and the figurines were just something we had on hand. Have fun!